SMALL SEEDS. Easy to grow from seed. Quick growing These care-free plants are a beautiful mixture of different colors shown in the picture. Can be started indoors in winter to be transplanted outdoors in spring....or can be sown directly into the ground or containers in spring, summer or fall. Instructions included. COMBINED SHIPPING DISCOUNT....ALL ADDITIONAL ITEMS SHIP FREE. In frost-free zones, Lobelia erinus, can perform as a perennial, but in most areas, it is a popular annual that is colorful and versatile. Lobelia makes a nice ground cover with a compact, trailing growth habit. Masses of blooms cover the green foliage. 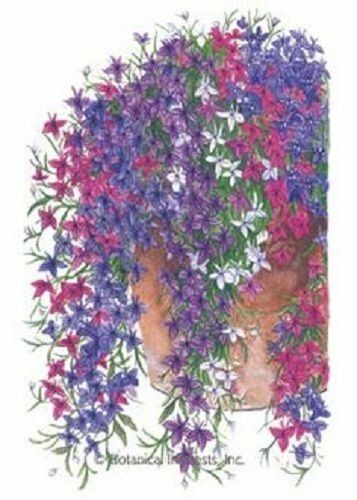 Lobelia is also perfect for edging borders, rock gardens, hanging baskets and window boxes. 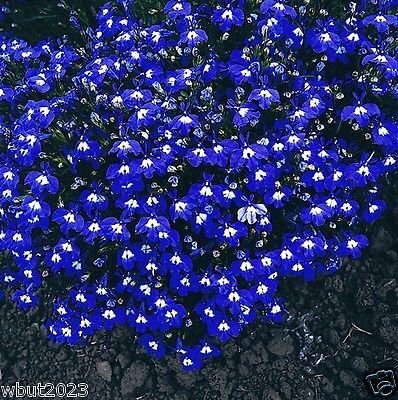 This variety, Blue Carpet, has small bright blue flower. They bloom from summer through fall and are showy and dependable! 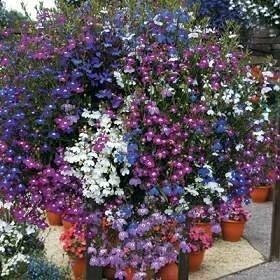 Grow Blue Carpet alone or combine it with other Lobelia varieties for a beautiful scene of color. Lobelia is not drought tolerant, so make sure it is watered deeply during periods of high temperatures. Start the seeds indoors 8 - 10 weeks before the end of frost season. Press the seed into the soil and do not cover it. Keep the seed moist continuously. With a temperature of 72F, germination is usually within 21 days. Transplant outdoors after danger of frost has passed. Space the plants 6 inches apart. For areas with a long growing season, the seed can be started directly outdoors in a prepared seedbed after danger of frost as passed. Grow in full sun to partial shade and in well-drained soil. Lobelia is usually resistant to deer. 50+ TINY SEEDS...... EASY PERENNIAL TO GROW FROM SEEDS! TRAILING PLANT 18 INCHES LONG.....FOR POTS OR HANGING BASKETS. THE GORGEOUS FLOWERS ARE A DARK BLUE . FULL SUN OR PARTIAL SHADE. CAN BE STARTED INDOORS IN WINTER TO BE TRANSPLANTED OUTDOORS IN SPRING, OR CAN BE SOWN DIRECTLY INTO THE GROUND IN SPRING OR SUMMER. INSTRUCTIONS INCLUDED. 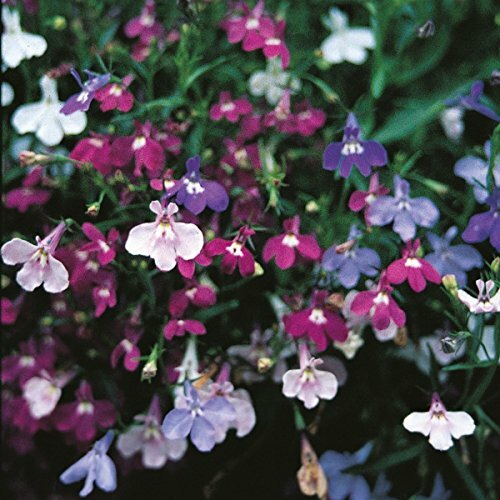 WE ALSO HAVE LOBELIA SEEDS AVAILABLE AND LISTED ON EBAY LOBELIA IN THE FOLLOWING COLORS: REGATTA LILAC, REGATTA WHITE, REGATTA ROSE, REGATTA ROSE/BLUE MIX AND LOBELIA RED CARDINAL FLOWER (VINING), BLUE CARDINAL (VINING) AND REGATTA MIX. INSTRUCTIONS INCLUDED. 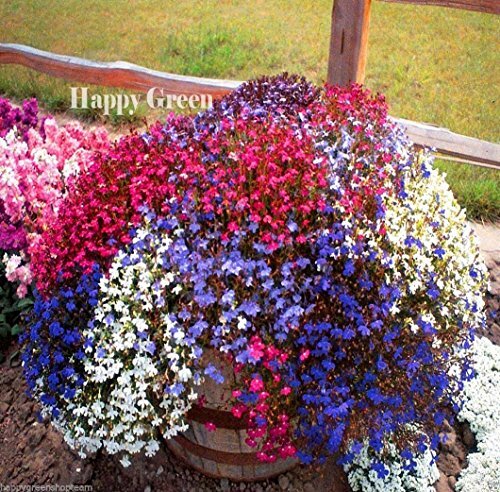 What a gorgeous display of color grown from Lobelia seeds. Lobelia seeds are easy to start and quick to grow. 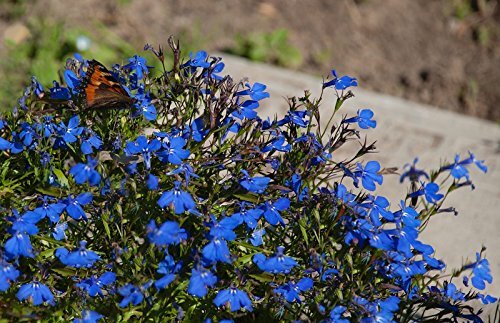 Lobelia is a very popular annual that adds striking color to many diverse settings. 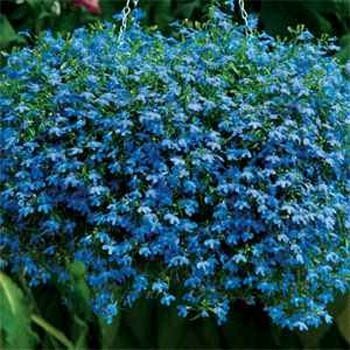 Use Lobelia plants in containers, hanging baskets, edging along the flower garden, and as a general ground cover. It's very versatile and loves to bloom all summer long! Lobelia is not drought tolerant, so make sure you water deep and long. The roots must have plenty of moisture to endure the baking hot sun in the middle of the day. Do not let it dry out. 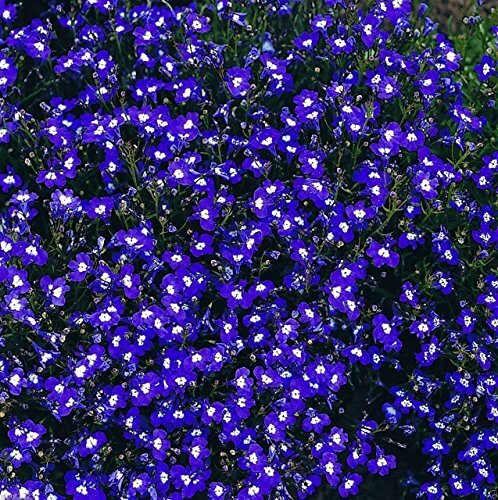 Lobelia flowers make a beautiful ground cover that performs well in full sun to partial shade. Lobelia - Pendula Cascade Seeds. Beautiful mixture of colours on trailing stems producing a mass of colour all summer long. The mixture for baskets and window boxes. Easy to grow from seed. 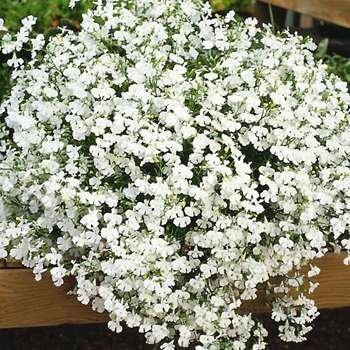 Quick growing These care-free plants are a glistening white. Can be started indoors in winter to be transplanted outdoors in spring....or can be sown directly into the ground or containers in spring, summer or fall. Instructions included. 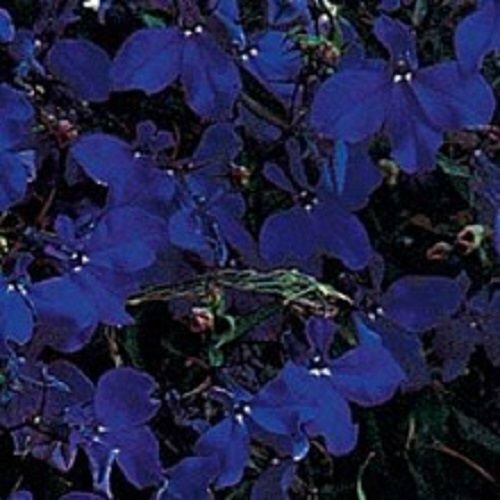 Compare prices on Lobelia Trailing at ShopPlanetUp.com – use promo codes and coupons for best offers and deals. We work hard to get you amazing deals and collect all available offers online and represent it in one place for the customers. Now our visitors can leverage benefits of big brands and heavy discounts available for that day and for famous brands.